After registration, you will be able to use SketShDb independent from a centralized server or service1 (or even from a network connection if you don't share your data with anyone). Nonetheless, one of the main features of SketShDb is to share data with others. For the purpose of distinguishing different users from one another, a unique user id is generated, which is done while registration. Additionally, a private device- and user-dependent encryption key is generated while registration and stored on the device. The user id is generated on our server and stored together with your e-mail address which will be used to confirm your account or reconfirm it if you forgot your account password. Your user id can be reused from different devices, just reuse the same e-mail address on each device. Otherwise you are not bound to using one account on each device. The e-mail confirmation mechanism is used to prevent other users to make use of your user-id. The device's public key will be signed by our registration server upon registration. This will allow usage of the private key for signing data records within SketShDb's databases, which in turn will ensure that data modifications from outside of the app (bypassing the rights and roles system of the app) will be discovered. The AppPIN protectes the app and its data on this single device from unauthorized access. The data of the projects on this single device is encrpyted using the AppPIN. Preferably, don't choose a PIN which can easily be guessed and don't use the device's PIN. If you use TouchID or FaceID for your device, you most probably never have to enter the PIN manually again. Nevertheless, make note of your PIN and kep it at a safe place! If TouchID/FaceID is not working for any reason you will not be able to access your data without the PIN. If you forgot your PIN, no one (not even we) will be able to help you! As the entire data of the app is encrypted wit your PIN, it is (at least at the moment) not possible to change it. Each project would have to be decrypted and then re-encrypted. This feature is currently not available. If you REALLY NEED to use a different PIN, there is only one possibility: Backup all of your projects, remove the app from your device, reinstall the app, set the new AppPIN and restore all of your projects. The PIN (or TouchID/FaceID) will by default be requested each time you start the app or activate the app from background. You can change this behavior under Settings / Authentication settings, so that PIN authentication will only be necessary if the app has been in background for at least the configured amount of time. 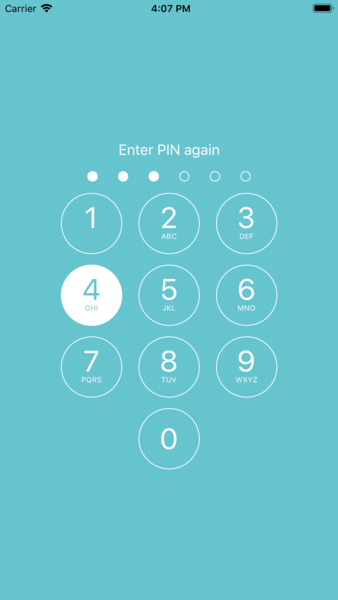 You can use different PINs on each of your devices, the PIN does not relate to your user id / account and is local to your device. The password protectes your user id (your account) from unauthorized use. 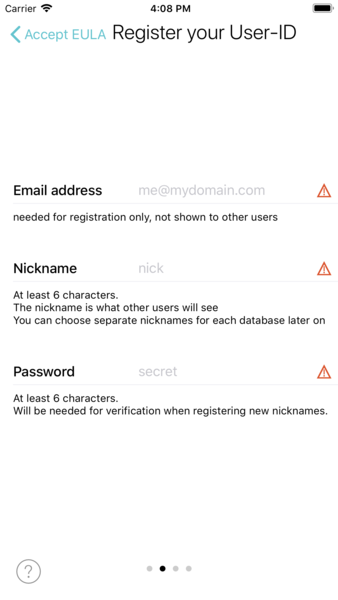 You only need the password when registering new nicknames for your user-id. You can change the password with every registration (in this case you will receive another confirmation mail). The password can be changed later on, as long as you have access to the registered mailaccount. When using the app on multiple devices, a complete registration (including email confirmation) is done on each device. Use same email adresses on each device to reuse the same user-id. First, please accept our terms and conditions. After submitting the information to our server you will receive a confirmation e-mail sent to the given e-mail address. 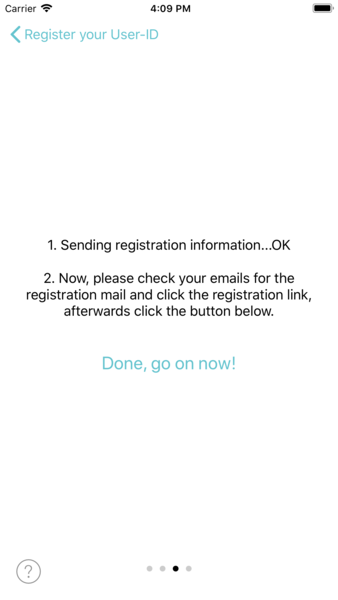 Then tap the button in the app to complete the registration. Nicknames A nickname is just a name which is shown in one or more projects as a replacement for your user-id. You can create as many nicknames as you want and use different nicknames in each project. You would be able to even use multiple nicknames within one project, but this doesn't make sense for the most cases. However, it may be of use, to have different nicknames in different projects, like your full name when sharing data with colleagues or just your firstname or a real nickname when sharing data with friends. Nicknames are stored on our servers only while registration and are deleted from our servers shortly thereafter. 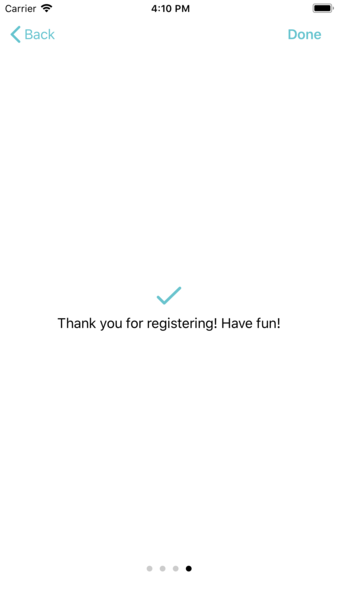 The registration form shows up automatically äfter the first start of the app after the PIN has been set. It can also be restarted manually at a later time by choosing Settings / Configure identities by tapping your user-id. Beware! When re-registering with a different e-mail address while having projects with defined roles, you will lose your user permissions with these projects (except you already used the projects together with the different e-mail address before, e.g. from a different device), i.e. most likely you will not be able to use these projects. If this is the case, you need to re-register with the old address, grant the necessary permissions to the new account and then re-register with the new address. After entering the needed data, tap on Next (button appears when all data is entered and valid) to submit the data. Now you are ready and can start creating your first project!